The Tower of Grade 1 Listed Coupland Castle was the last fortified building to be built on the Border. In earlier centuries it is recorded that there was a wooden blockhouse at Coupland for the inhabitant to take refuge in if the Scots came raiding. Long before the Tower was built the Coupland lands belonged to Sir John de Coupland who captured David the Scottish King at the Battle of Neville’s Cross in 1346. The present building now shows three if not four very distinct stages of construction. The earliest part is the main tower four stories in height probably built in the late 1580’s or early 1590’s after the finding of a Border Commission in 1584. When reopening the doorway between the main tower and the smaller tower the present owner found the date 1594 inscribed on the stone jamb. The smaller taller tower was probably built after the Union of England and Scotland when the Border had become more peaceful. The huge fireplace in the Court Room has the date 1619 and the initials GW and MW for Gilbert and Mary Wallis carved on it. An interesting feature of the tower is the upper spiral stair, which was designed for defence by a left-handed swordsman. The Court Room was sometimes known as the haunted chamber, the very well known ghost was exorcised in 1925. A separate farmhouse was built to the Southwest of the now L shaped tower in the 18th century. Sir Chaloner Ogle RN purchased Coupland from the Wallis family in 1713. On the 5/2/1722 Admiral Sir Chanoler Ogle, when in command of the “Swallow” captured the squadron of the infamous pirate Bartholomew Roberts off the coast of Africa. Roberts was said to have captured as many as 456 ships in a brief 4 year career and up to 22 ships at once. Captain Jack Sparrow from the films Pirates of the Caribbean is based on Roberts. In 1806 Nathaniel Ogle conveyed the Castle and estate of Coupland to Thomas Bates and Matthew Culley succeeded to the 1820. In the 1820’s the late Georgian part of the present reception rooms of the Castle. Matthew Cully the famous agriculturalist purchased paintings from Edward Landseer in 1826, the correspondence is held at the County Records Office at Woodhorn. Coupland remained in the Cully family until 1926 when it was sold to the Weidner family who in turn sold it to Sir Walter Aitchison in 1938. Sir Walter took a great interest in the gardens and planted the arboretum to the east of the house. The Castle was sold in 1971 and then changed hands twice before being purchased by the present owners in 1979. 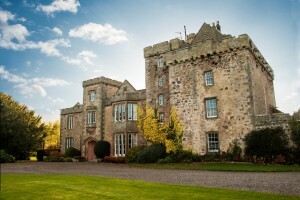 Coupland Castle as it now stands is the outcome of over 400 years of history. A very special building placed on a very special site, which has then been added to and embellished over the centuries. The Tower is furnished in period style and enhanced by a large collection of paintings. These are mainly the work of the present owner’s mother Pauline Konody who painted in watercolours and maternal grandmother Isabel Codrington RA who painted in oils. They both exhibited widely during the 1920’s and 30’s. 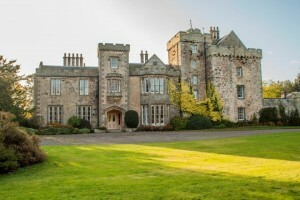 Externally the Castle now sits in 25 acres of garden, arboretum, woodland and paddocks. The arboretum has a mass of daffodils in the spring and the specimen trees are a delight. Of special interest is a Pocket-Handkerchief Tree from Indo China, which flowers in late May. The whole scene is presided over by the Cheviot Hills to the south. The nearest and largest hill is Yearling Bell with its 17 acre Iron Age Fort dominating the area.